The paleo diet gets its name from the Paleolithic Era and focuses on foods that hunter gatherers would have been able to acquire during their time on Earth, approximately 2.6 million years ago. This means no processed foods, no refined sugar, no legumes, and very small (if any) amounts of dairy. It also means that finding paleo fast-food options seems largely impossible, what with fast food being the antithesis of the paleo diet and the king of processed junk (not to mention drive-thrus didn’t exist 100 years ago, let alone 2.6 million). That being said, while no fast food will ever be fully paleo, if you've embraced the lifestyle or are going through the paleo-adjacent Whole30, there are methods to make your fast food meal more compliant and a number of dineries that have accommodating options, as long as you’re willing to compromise on some of the ingredients and temper your expectations. Start at these eight paleo-friendly spots. 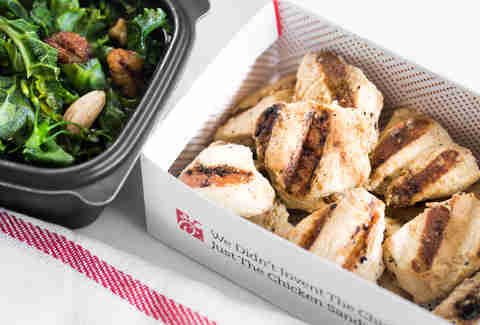 Chick-fil-A’s grilled chicken nuggets make the perfect paleo snack food: They’re fun and bite-sized, and if you’re looking to create a more fulfilling meal, you can order their superfood side salad, plopping them onto a a medley of kale, broccolini, dried cherries, and nuts. Swap out the dressing for lemon juice to avoid added sugar. 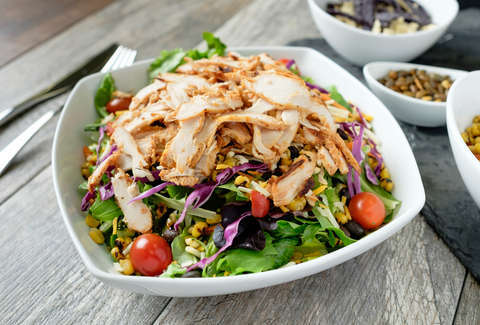 For bigger appetites, there's also a pair of salads -- Spicy Southwest and Grilled Market -- that can be ordered without the cheese. Maybe dump in an order of grilled nuggets to compensate. They're the closest thing to croutons you're gonna get. 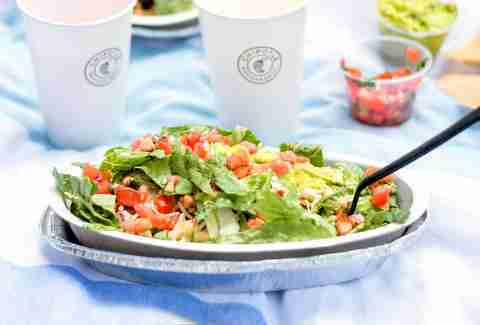 Chipotle is a small paleo dream because you finally have an excuse to ball out on extra meat and guacamole. To make your Chipotle bowl fit into the paleo guidelines, you’ll want to skip the rice and beans and settle with salad as your base. Choose whichever protein you’d like (except soyrizo) and top it off with guacamole and tomato salsa. Since dairy isn’t allowed in paleo, you’ll have to say bye to the cheese and sour cream, but, hey, at least you have guac to console you. 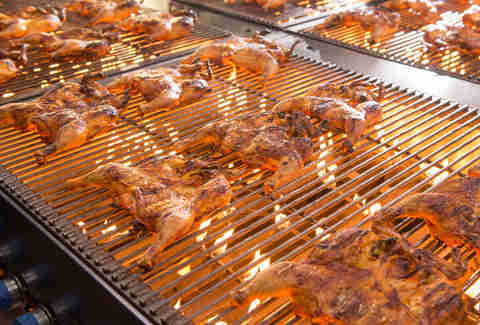 For those not in the know, El Pollo Loco is a massive west coast chain that specializes in flame-grilled chicken, which is either chopped up and stuffed into burritos, quesadillas, tacos, and bowls or, more of interest to this article, served on a platter, bones and all. (It is also, it should be said, the unsung hero of my life.) Though the sides don't adhere to the paleo guidelines, the chicken definitely does, with the added caveman-pleasing touch of being cooked over open flame. 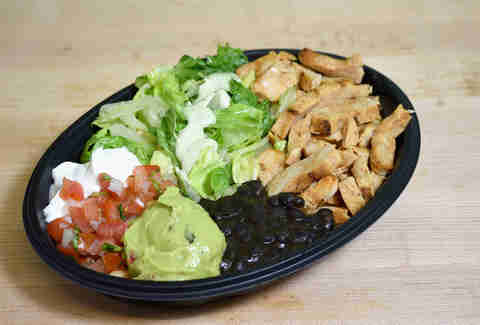 Order the grilled chicken and go for a side salad with salsa and avocado. Just make sure you skip the cheese, sour cream, corn, and tortilla strips. Most burger joints will happily give you a bunless, cheeseless burger. 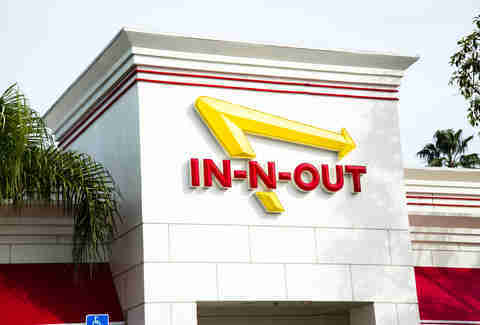 But In-N-Out actually makes it fun thanks to its "secret" menu, which has a solid paleo option in the form of its "protein-style" burger, which plops the freshly ground burger between leaves of old, crisp lettuce. Sadly, you have to skip ordering it Animal style, but you can definitely get grilled onions. Plus, you can go for a double patties, or a triple, or quadruple. The sky's the limit. Well, actually, four patties is now the limit for a single burger, but you can keep stacking by ordering multiple meat towers if you feel you need to. At Jimmy John’s, they have what’s called an “unwich,” which takes your favorite sandwich and transforms it into a joyous lettuce wrap. 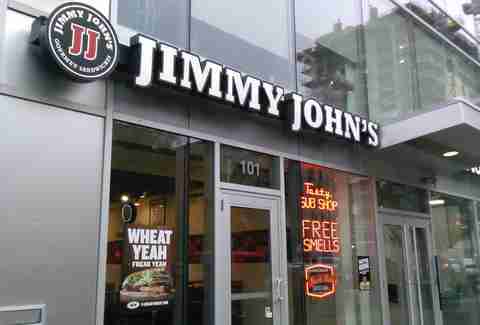 Although Jimmy John’s slices their meat everyday in house, some are mightier than others when it comes to the paleo diet. I’d recommend snagging turkey, roast beef, or bacon, and skipping the salami. Avoid pickles, as they’re full of unnecessary sodium, and settle for fresh tomatoes, lettuce, onion, and avocados instead. And if the free smells prove too tempting and you end up with day-old bread, you can always atone by using it as a weapon instead of eating it. Does Panera actually count as fast food? I say yes, though they'd probably prefer fast-casual. Anyway, it's kind of weird to associate something with Bread in its name with a diet that involves zero bread, but the chain's actually one of the best options for paleo and Whole30 participants. Most of Panera’s standard salads are paleo friendly, as long as you skip the cheese, crispy wonton strips, and dressings. If you’re seeking something more protein-rich, Panera actually has paleo-appropriate dishes off their not-so-secret menu developed back in 2012. 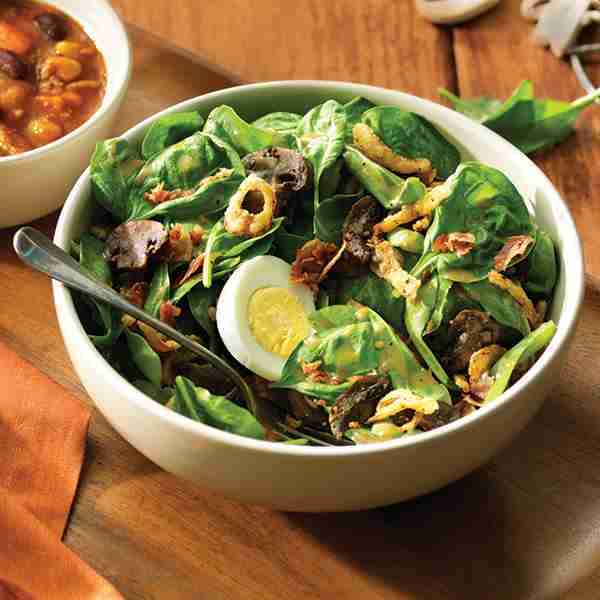 This includes a breakfast egg bowl that comes with steak, tomatoes, avocados, and -- you guessed it -- eggs, as well as a turkey salad complete with raw onions, bacon, baby spinach, and hard boiled eggs. As previously mentioned, most burger places will gladly charge you full price for a burger with nothing on or around it. 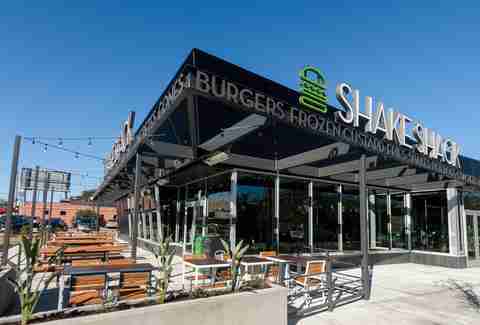 So, why single out Shake Shack? Because their burger patties are 100% beef with no hormones or antibiotics ever, which is pretty paleo, if you ask me. Although you have to forgo Shake Shack’s impossibly soft potato roll in favor of lettuce, you can make up for it with a couple slices of bacon. The burger arrives with tomato, lettuce, and onion. No cheese -- or ShackSauce™ -- please. It doesn’t seem like Taco Bell would be a good option for the paleo diet due to its abundance of rice and beans, but there are actually plenty of dishes that can be made paleo once you take away the legumes and tortillas. One good option is the power menu bowl; substitute rice and beans with extra lettuce and ask for it “al fresco,” replacing the cheese, sour cream, and avocado ranch with pico de gallo. A naked egg taco with just bacon, guacamole, and pico de gallo is also a great choice and the perfect paleo breakfast on-the-go. Add steak if you’re looking for an extra punch of protein. Kat Thompson is a staff food writer at Thrillist. Her favorite paleo food is a medium rare steak. Find her on twitter @katthompsonn.